Less than 48-hours after Artisan Meat Share shuttered, Chef Bob Cook took the helm as executive chef at Edmund’s Oast, and Charleston exhaled in shared relief. Almost immediately, Chef Cook started tinkering with the establishment’s “gastropub” menu, nixing the beloved pickled shrimp and taking things in an undeniably upscale, ingredient-driven direction. The move is obvious in the chicken liver parfait ($12). Accompanied by three slices of grilled bread, it conjures reveries of a bacon mousse, especially if you get an accompanying mouthful of bacon. Smooth and airy — yet notably decadent — it’s topped with mustard seeds, bacon, and olives, which provide a welcome, pungent break from the overall richness. Well-balanced, everything is just a little bit salty, probably to hasten the consumption of adult beverages. On that note, practice restraint if you dare to follow the personable server’s advice and try the Red Wedding ($12) cocktail. What’s in it? Pure, unadulterated booze. The bourbon hits at shot-level strength, prompting a near-instant drunk. 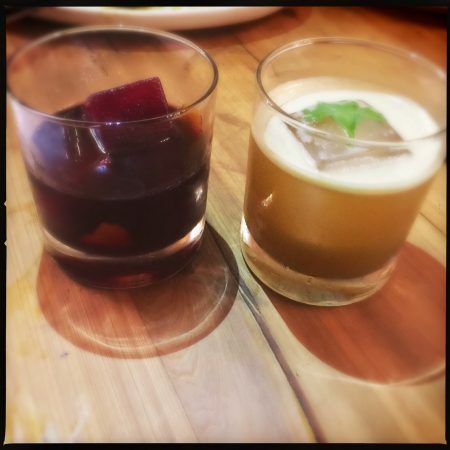 If tipsy memory serves, the waiter later gushed excitedly about the 17 different ingredients in the giant square ice cube and how it provides a shifting taste experience throughout the melt: A) That melt takes a while. B) Technically, that information might have been good to have before drinking several mouthfuls of straight liquor, but the buzz probably only made the delicate poached shrimp ($15) even more pleasurable. Pickled shrimp lovers take heart. No, this is not the dish of yore, but a light and summery medley worth consideration. Delicate in constitution with bright, citrusy notes, it’s a bit like a Southern ceviche. 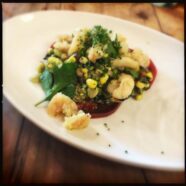 The dish’s base layer is comprised of two perfectly ripe, heirloom tomatoes upon which the fresh corn, lima bean, and parsley hash is placed. The elements of summer combine perfectly with the four lemony shrimp. 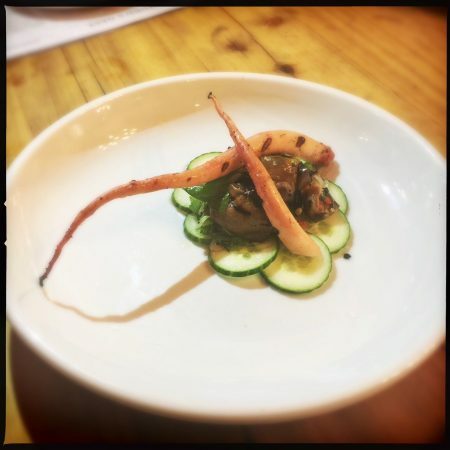 Portion size may come into question when compared to the price, a complaint that reemerged with the grilled octopus ($15). It seems my streak of superlative octopi dishes has raised the bar to irrational levels, while deeply influencing what I have come to expect visually. Accordingly, when the Oast’s grilled octopus version came out, I thought they’d accidentally brought me a vegan dish. A circle of cucumber slices is topped with a powerfully salty, Asian-influenced grilled eggplant salad dressed with fish sauce, sesame seeds, and cilantro. What look like two, slender grilled carrots on top? Those, my friends, are the fragile arms of a pre-pubescent octopus. Although slightly overcooked and chewy — it’s probably hard to nail the timing on a cephalopod that tiny — the smoky, charred meat and zesty salad work well together. As for the vibe, Edmund’s Oast’s music overhead is hip and eclectic, much like the assembled crowd. Pink Floyd follows Band of Horses, while hipsters at the outdoor bar sit alongside couples in intimate conversation. A small fight broke out at my table as our growing awareness of the unexpectedly covetable salt chicken spread ($18) kicked off a fork-clashing land grab. Basmati rice is topped with a spicy Thai green curry resplendent with slivers of kaffir lime leaves. The piquant, fiery flavors were brilliantly complimented by “why didn’t I think of that?” bits of crisp, buttery fried chicken. Made with wing and thigh meat (“the pieces we don’t use in the roasted chicken dish”) each bite is both crisp and tender, while full of fatty flavor. It’s one of those simple, virtuoso ideas that will have you forever craving green curry with your fried chicken in the future. 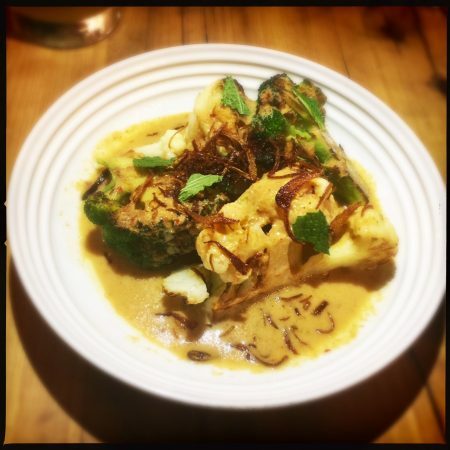 While putting myself through college, I worked in the kitchen of a cult-owned vegetarian restaurant with no set menu, except for a coconut milk-based curry that was served daily. Edmund’s broccoli + cauliflower ($14) was so reminiscent of that dish, I started having flashbacks to a simpler time filled with strange religious beliefs and tempeh. Back on Morrison Drive, the green and white heads are served face-to-face and topped with an aromatic curry, bright with the flavors of cumin, coriander, and turmeric. 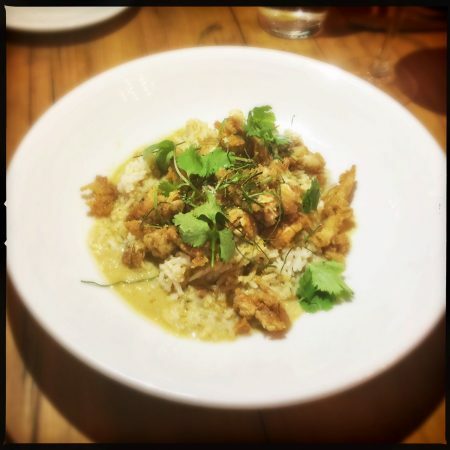 More Indian than Southeast Asian, this is a unique and pleasing dish even when consumed at the same time as the decidedly Thai — and thus completely different — salt chicken curry. The only dud of the night took the form of the tempura trigger fish and shrimp ($28), a smushy, mushy riff on shrimp and grits. 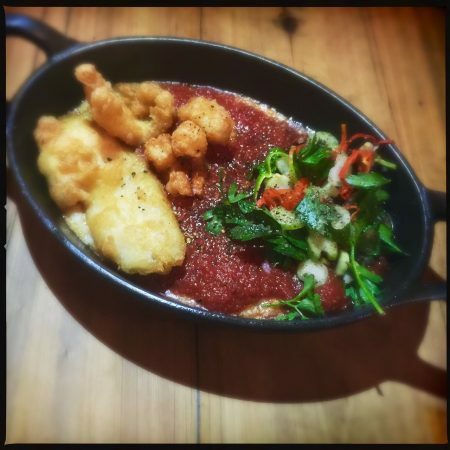 The ethereal fried seafood is plated on a bed of grits and a thick red, marinara-like sauce. Accompanied by an herb salad made with celery, bell pepper, and cilantro, I appreciate the clever deconstruction, I’m just not sure it works as well as it could. Although the delicate fish was lovely, the tempura begs for a lighter, more acidic accompaniment or just needs to be replaced with a coating more hearty and sog-resistant. But that was my only complaint. Long known for its charcuterie, Edmund’s Oast brought in one of the best artisans in town, and although we got used to the sight of him behind a glass case at AMS, it’s good to see Chef Cook bustling around the kitchen. 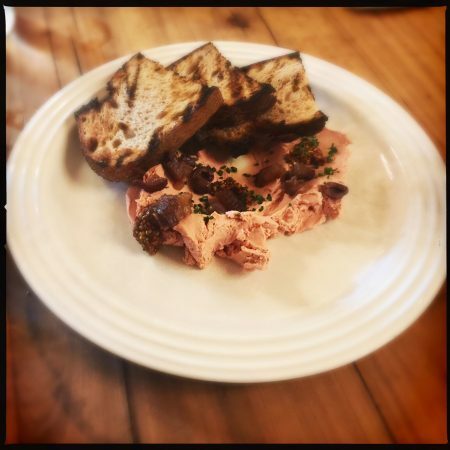 And while inventive craft beers and superlative cured meats are still to be expected, it’s Cook’s thoughtful, carefully executed delights like the poached shrimp and the salt chicken that are truly not to be missed.